Global coal gasification market expected to reach around 3,89,825 MW by 2026, growing at a CAGR of approximately 10.8% for the forecast period 2018 to 2026. The fertilizer segment is anticipated to hold the major market share during the forecast time period. In 2017, this segment held more than 40% of the market share in terms of volume. The report analyzes and forecasts the coal gasification market on the basis of application, process type, and region. The study shows past data from 2014 to 2017 along with a forecast from 2018 to 2026 based on volume (Megawatts). Assessment of market dynamics gives a brief thought about the drivers and restraints for the coal gasification market along with the impact they have on the demand over the forecast period. Furthermore, the report includes the study of opportunities available in the coal gasification market on global and regional levels. The report gives a transparent view of the coal gasification market. We have included a detailed competitive scenario and portfolio of prominent vendor’s operative in the global coal gasification market. To understand the competitive landscape of coal gasification market, an analysis of Porter’s Five Forces Model for the market has also been included. The report offer market attractiveness analysis, wherein the application, process type, and regional segments are benchmarked based on their general attractiveness, market size, and growth rate. The study provides a crucial view of the coal gasification market by segmenting the market based on application, process type, and regional segments. All the segments of coal gasification market have been analyzed based on present and future trends and the market is estimated from 2018 to 2026. 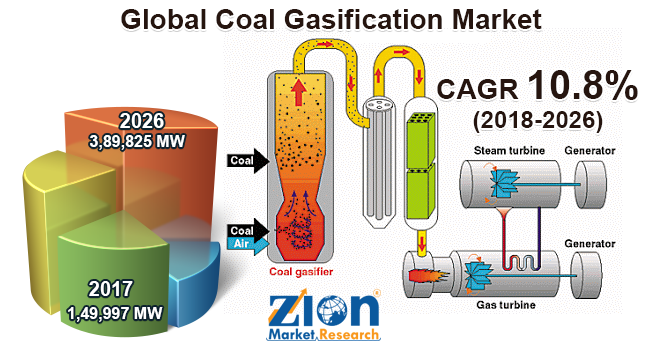 The global coal gasification market is segmented into application and process type. On the basis of the applications, the coal gasification market is divided into fuel gas, feedstock, power generation, fertilizer, and chemical make. By process type, this global market is categorized into moving bed, fluidized bed, entrained bed, and molten bed. The market is analyzed based on five regions—North America, Europe, Asia Pacific, Latin America, and the Middle East and Africa. These regions are also fragmented into major countries, such as the U.S., Canada, UK, France, Germany, India, China, Japan, and Brazil. The major market players involved in the coal gasification market are General Electric Company, Royal Dutch Shell Plc, Mitsubishi Heavy Industries, Ltd., Sedin Engineering, McDermott International, Inc., KBR, Inc., Oil and Natural Gas Corporation Ltd., ThyssenKrupp AG, and Petrochemical Corporation of Singapore (Private) Limited, among others.